Peridot (also sometimes called Chrysolite) is the gemstone derived from the mineral Olivine, so named because it’s coloured olive-green, with a tinge of gold. Olivine is a magnesium iron silicate, and it’s the iron that produces the greenness. 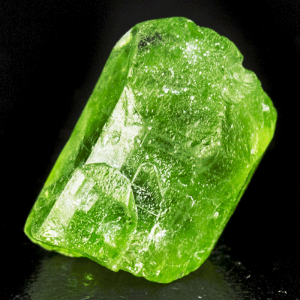 Peridot is found in rocks that have erupted during volcanic activity, and it also occurs, much more rarely, in certain types of meteorites from outer space. 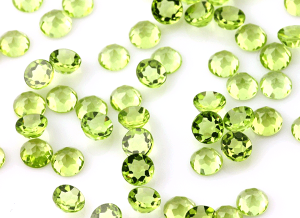 The origin of the name Peridot is uncertain. It could derive from the Arabic word faridat meaning gem, from the Greek peridona, meaning to give plentifully, or from the Latin paederot, describing a type of opal. Peridot has been mined for around 3,500 years, originally from the small volcanic island of Zabargad (St John) in the Red Sea between Egypt and Saudi Arabia. It is now obtained widely, from Australia, Brazil, China, Kenya, Mexico, Myanmar, Norway, Pakistan, South Africa, Sri Lanka, Tanzania and the USA. The ancient Egyptians called Peridot ‘the gem of the sun’ due to its brilliant colour in sunlight, and they believed it had the power to lessen anxiety, enhance speech and bring success in relationships. The ancient Greeks thought Peridot gave dignity to the wearer. It was believed to drive away evil spirits when set in gold, or when strung on the hair of a donkey and worn over the left arm. The ancient Romans called Peridot ‘the emerald of the evening’, since its green radiance could still be seen at night under lamplight or moonlight. The crusaders brought Peridot to Central Europe in the medieval period, where it was used to decorate medieval churches. A wonderful example can be seen in the famous Shrine of the Three Magi (c1190) located at the Roman Catholic Cathedral in Cologne, Germany. 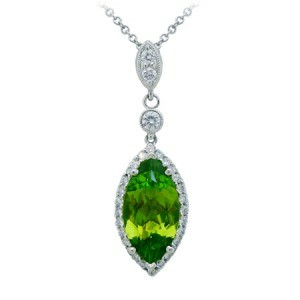 During the baroque period (around 1600 to 1750), the green beauty of Peridot was particularly popular for jewellery. Drinking goblets were carved from Peridot, whenever a large enough piece was found, since there was a belief that to drink medicine from a Peridot cup strengthened its power to heal. 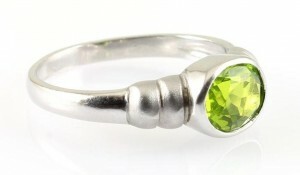 Peridot is cut in accordance with its crystal shape, mostly in faceted style to form small gemstones. Rounded, dome-shaped cabochons are cut when Peridot contains more inclusions, since this polished, rounded shape wonderfully highlights the fine silky lustre of the inclusions. Care: Peridot should not be cleaned with steam or ultrasonics. Clean it with mild dishwashing soap in water. Use a soft brush to get behind the stone where dust can collect.